She was born in Germany in 1922 before returning with her parents to her mother’s village in central Poland in 1926. Not quite 17 when the Second World War broke out and living under German occupation, she knew she would be taken away to a labour camp or to work on a farm in Germany. Hoping not to be sent too far away from her home, she heard of farms just across the border so she volunteered her services and was relocated in 1941. This farm was only about 70 kilometers away from her home so she did hear from her family occasionally but ended up working there to the end of the war. 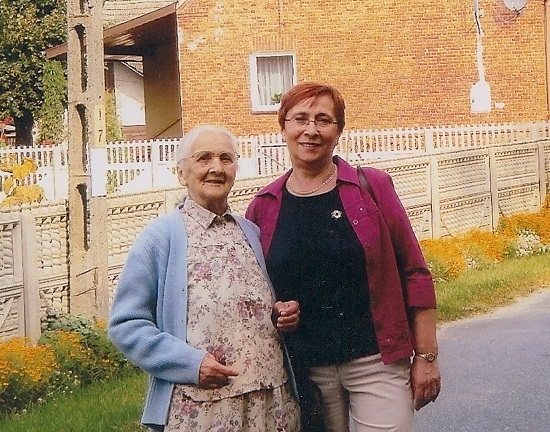 Gertruda and her Mama, Jozefa, on a recent visit to Poland. In the spring of 1945, as the Russian troops were marching across Poland and the Germans retreating, stories of mass killings and destruction were prevalent and she had had no news of her parents. Although she was born in Germany and had the option of staying there, she trusted no one and decided to return back to her village walking the entire 70 kilometers back home. Fortunately her parents had survived and she was reunited with her mother in their Polish village. In 1946, with her belongings in a wooden trunk, she came to live on her husband’s farm. The house had only a straw roof and drafty windows. The family lived in one room with a large bread baking oven in the center. People were born and died in that room. She lost two infant sons in that room as there was no doctor close by and, with a horse and buggy on a muddy dirt road, help could not come in time. The first medical clinic for the area was finally built in 1957 and electricity was not available until 1966. Life was hard for my mother but giving up was not an option. She persevered, working side by side with her husband at home and in the fields. She was not just a wife, she was a partner. Work was backbreaking and farm tools were ancient and primitive. However, we were the second family in the village to build a brick house. She took upon herself to build a bread baking oven in the new house as no one in the village knew how to construct one. My mother had only a grade 6 education. Most of the crops went to the government cooperative so, to make extra money for her family, she sold farm produce at a village market 12 kilometers away. We traveled there on a bicycle laden with everything including live chickens selling most of it along the road before we even made it to market. Things never really got any easier for her. One afternoon, I watched her riding away with our neighbour on his motorcycle, holding on to him with her left hand because the right one was wrapped in a bloody cloth. She had been in a farm accident losing her thumb and index finger. She had to learn to use her left hand, she persevered, and she never gave up. Farming was her passion. She loved the land and she had a family to feed and take care of. In fun times I loved combing and braiding her long hair. Sometimes she opened her wooden trunk and we would play dress up. I often think that that she would have liked to be an actress. She was also a great knitter and a seamstress. I remember falling asleep to the sound of her sewing machine. She was the first feminist I knew. Her opinion that priests only baptised children, but did not feed them, was progressive in a country heavily influenced by the Roman Catholic religion. When I left my mother’s home in Poland in 1973, there was still no indoor plumbing and rural Poland remained primitive and isolated for many more years regardless of what political regime was in power. In 1984 she came to Canada to visit. It was the first and only time she ever went on a plane but she got to meet her son-in-law and her grandchildren. Although they were still very young, to this day they still remember her for the giant snow hill she built for them in our yard. Today she lives with her family in the house that she built with her husband. The farm was passed on to the next generation in exchange for a meager government pension. The money gives her the independence that she values so much and her days of hard work are finally over. Truthfully, she misses the work and is heartbroken watching the empty fields as the younger generation has chosen a different path. As for me, I did spend my younger years with her. However, as a teenager, I went to a government boarding school and then left for Canada at the age of 21. Did I find her too strong then? Probably. Was I running away from her? Maybe. It took me a long time to understand that her love for me did not come in hugs and kisses but in that strong sense of self that comes from not giving up. Today as I am getting older I see the lessons she taught and know that she has been my pillar and a guiding light all along. If I had to describe her by one word, it would be: independent. She values that the most even now. She is 91 and I hope and pray that when her time comes, God will have a special place for her in heaven. I am Gertruda and she is my Mama, Jozefa Jarzębska Siwik, and this is HERstory. This entry was posted in Daughter, Inspirational, Mother, Wife, Women and tagged Canada, children, friend, friendship, Grandmother, herstory, inspiration, Inspired by my mom, inspiring story, Mother, Poland, Second World War, tribute, wife, Woman. Bookmark the permalink.